Turn off the power in your house/place of shelter at the main fuse box. Keep phones and other important gadgets charged whenever you have electricity. Do not use electronic equipment if floor is wet. Keep away from ceilings that are sagging. Avoid going near power lines. Do not consume street food. Avoid all food that has been touched by the flood water. Always carry a health kit. Use floodlights/emergency lights while driving and do not drive fast. Wear proper clothing that covers your body because the flood water is dirty and may carry germs. Do not take shortcuts and only follow the routes which are specified by the officials. Avoid taking routes where the waters have receded, Weak roads may collapse. Avoid going on bridges if the water under it is high and moving quickly. If you are stuck outside and want to return home, first ensure that you have a green signal from the authorities. Stay tuned to the radio/television for updates. Follow instructions by the authorities. Try and stock up on non-perishable food - including glucose biscuits, canned goods. Use flashlights, and stock up on batteries. Keep your friends or family informed about your whereabouts. 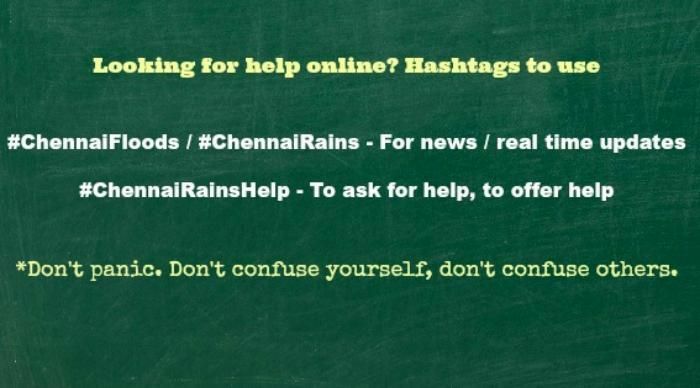 Check Twitter and Chennairains.org for information about the people and places near you that are offering food and water. 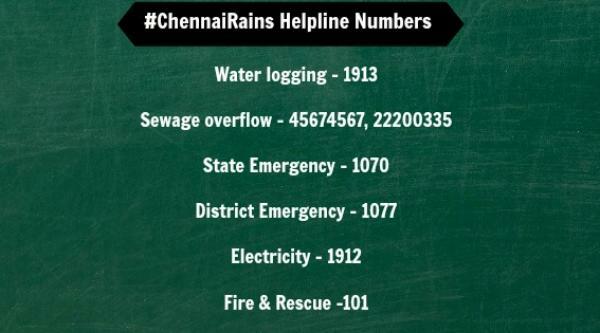 Keep track of emergency helpline numbers and other information needed.